“Dark Matters: Artists See the Impossible” is a group exhibition of hi-tech installations, photography, video and conceptual projects that uncover the unexpected, the invisible and the hidden. Delving into the obscure and often sinister, the works allow us to experience what we only suspect exists. 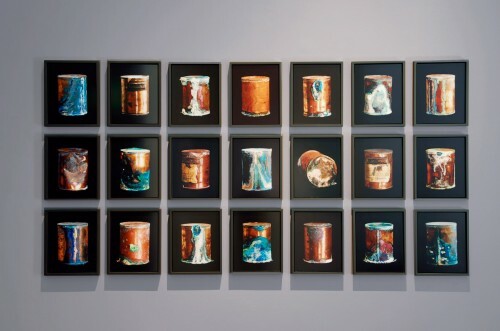 David Maisel presents photographs from his recent Library of Dust series, depicting deteriorating metal canisters containing the unclaimed ashes of asylum patients. Providing a powerful pictorial depiction of death, decay, and abandonment, Maisel’s photographs delve into some of the darkest subject matter in the exhibition. As silent meditations on the nature of being, and becoming, the enigmatic canisters in the photographs portray elusive and obscure matters of the world that remain just beyond our reach.